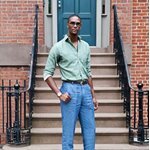 Chris Bosh is an American professional basketball player who currently plays for the Miami Heat of the National Basketball Association (NBA). 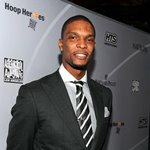 A high school "Mr. Basketball" in Texas, Bosh left college at Georgia Tech after one season with the Georgia Tech Yellow Jackets men's basketball team to enter the 2003 NBA Draft. He was selected fourth overall by the Toronto Raptors in a very competitive draft class. 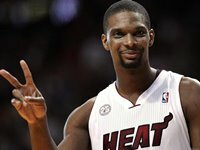 While at Toronto, Bosh emerged as one of the young stars in the league; he became a five-time NBA All-Star, was named to the All-NBA second team once, appeared for the US national team (with whom he won a gold medal at the 2008 Olympics), and took over former fan-favorite Vince Carter as the face and leader of the Raptors franchise. 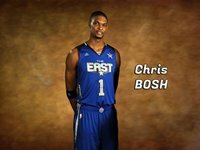 In the 2006–07 season, Bosh led the Raptors to their first NBA Playoffs berth in five years, and their first ever division title. 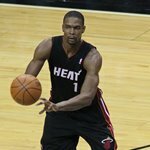 He left Toronto in 2010 as its all-time leader in points, rebounds, blocks, double doubles, free throws made and attempted, and minutes played. 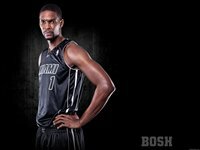 Bosh won his first NBA title after Miami defeated the Oklahoma City Thunder 4–1 in the 2012 NBA Finals. 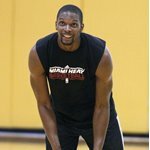 In a strong draft class including future All-Stars LeBron James, Carmelo Anthony, and Dwyane Wade, Bosh was selected fourth overall by the Toronto Raptors in the 2003 NBA Draft and was signed on July 8, 2003. 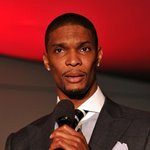 Prior to his signing, however, other NBA teams made offers for Bosh as they knew Toronto needed a veteran scorer, and Raptors star Vince Carter himself pressed for a trade. General Manager Glen Grunwald turned everyone down. 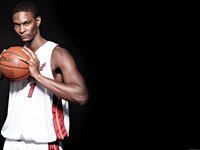 In his rookie season Bosh was forced to play out of position as the Raptors' starting center after Antonio Davis was traded to the Chicago Bulls. Night in and night out the wiry teenager battled against opponents who had a significant size and strength advantage over him. 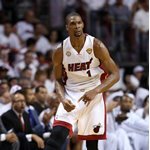 Bosh—who cited teammate Michael Curry as his mentor—was often praised by his coaches for his heart, and willingness to play through pain and injuries resulting from his lack of body strength compared to some of the league's strong forwards and centers. 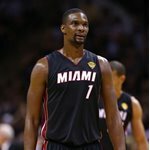 Bosh's contributions were not unnoticed by teammates either, as he averaged 11.5 points, 7.4 rebounds, 1.4 blocks, and 33.5 minutes in 75 games, leading all rookies in rebounding and blocks, and setting a franchise record for most rebounds in a rookie season with 557. 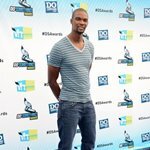 Bosh was rewarded by being selected to the All-Rookie First Team for the 2003–04 season.